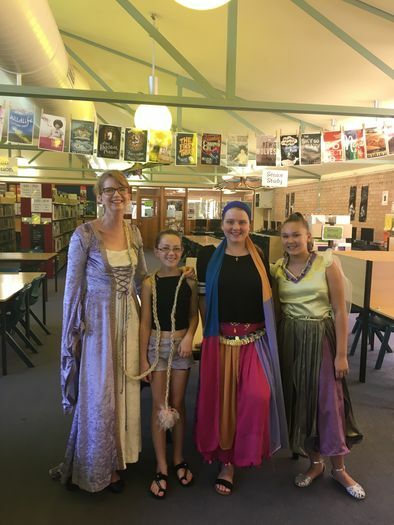 The SRC and the library had a Mufti Day and Bake Sale to raise money for girl's education in poorer countries on Monday 22nd October. And we raised an amazing amount of $1337! The 'Room To Read' program supports literacy and girl's education. When Girls Stay in School, Life Improves...for Everyone. Whether or not a girl stays in school has an astounding effect on not only her quality of life, but on her future family’s as well. For a girl in one the most underserved parts of the world, staying in school longer means she is more likely to build a smaller and healthier family, lower her probability of contracting HIV, and earn a higher wage. She is also more likely to marry later and educate her own children — ending the cycle of illiteracy in one generation. The amount raised is enough to send 4 girls to school for a year! Thank you everyone for your wonderful support, and a HUGE thank you to Ms Haggar and the SRC for their fabulous cooking and marketing skills! Aussie Books for Zim is an Australian charity that collects books and stationery from Australian communities, schools, families and individuals to set up school libraries in rural Zimbabwe. The organisation seeks to improve literacy in these communities, in order to empower children with knowledge and the confidence to contribute to shaping the world they live in. Wollongong Living Books reached a 10-year milestone this year. It was celebrated with a special event, and I was very honored to be invited…”As an amazing long-time champion of our program”. 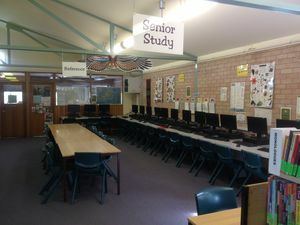 I ran the original pilot program for schools 10 years ago at Bulli High School and Wollongong High has been a long-time supporter of this wonderful program since 2010. The living ‘books’ are an extraordinary group of volunteers who enjoy sharing their stories with others. Their backgrounds are diverse, in terms of culture, language and faith background, gender, sexuality, age, ability and occupation. Readers’ are invited to engage in a half hour conversation with a ‘book’. 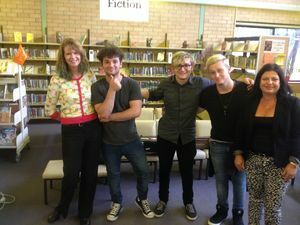 We had two amazing speakers come the Library and tell their stories to all of year 8 for Reconciliation Week. Beck Simon and Dale Wright had the students captivated telling their stories. A huge thank you to Beck and Dale for taking the time to come and share their stories with us at WHSPA. This is a fictional story about a ball game played by Aboriginal people more than 150 years ago in North Western Victoria. The book is set in the Grampians and based on a story that Titta has been listening to since she was a child. 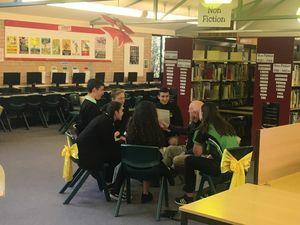 The Library is running a Reading Program with 100 students from years 7-10. The program is aimed at improving student reading levels. After doing a reading test, the students are then directed towards books at their level of reading. 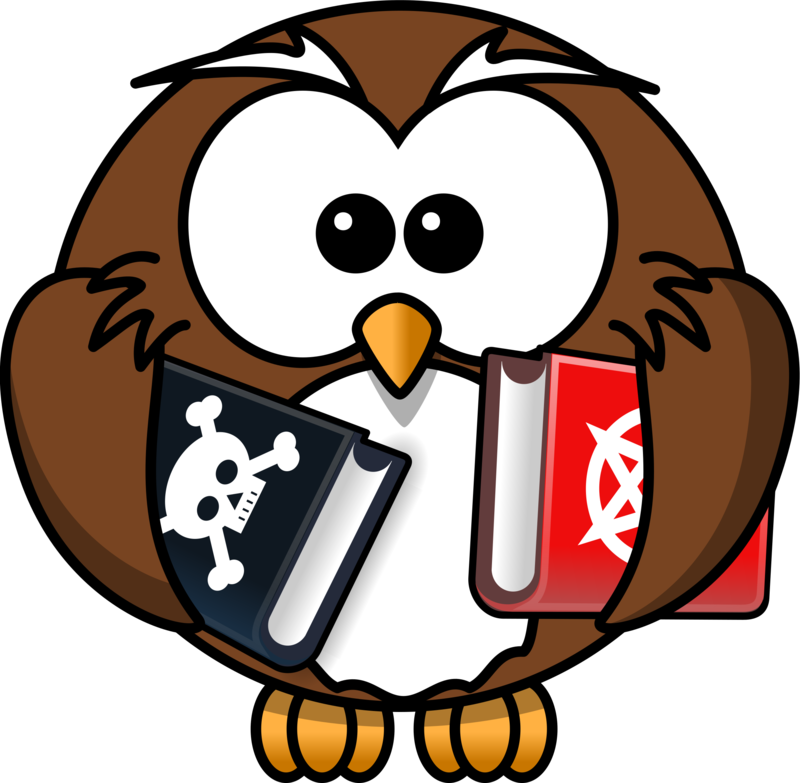 Books are chosen based on the students age and their reading level. Students will then do comprehension quizzes after reading each book. 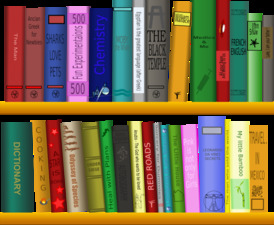 Students are encouraged to read their books during English Reading and at home. The school has funded hundreds of books for this program and the Library has spent over 6 months setting up the program and the books in the Library. We are enthusiastic about the potential outcomes! 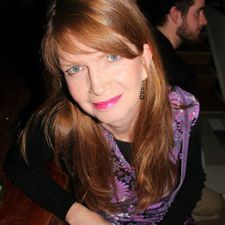 If you have any questions about the program please call me, Liane Pfister, the Program Co-ordinator. 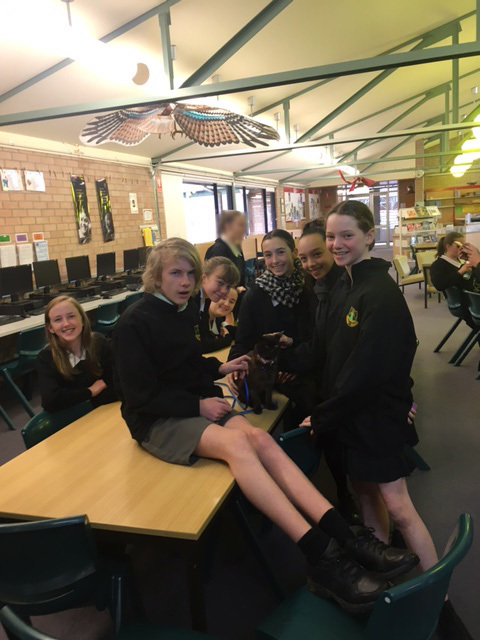 All Year 7’s are part of the Premier’s Reading Challenge. All students are encouraged to read 20 books by August. 15 of the books must be from the Premier’s Reading Challenge Book List. 5 of the 20 books can be of the student’s own choice. Students can access the Premier’s Reading Challenge using their DoE portal userid and password. Any problems, pop into the Library and see Mrs Pfister for help. 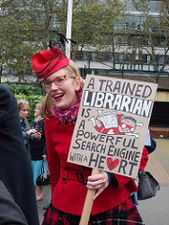 During March we organised Academic Journal Database courses with Wollongong City Council Librarians which ran over 3 days. They ran 6 x 80 minute sessions, covering 10 Senior HSIE classes and a small group of Year 10 English students. We organised over 50 Library cards for the students that don’t yet have a Wollongong Council Library card. With this Library card they can access all these valuable resources for FREE! Mr Phasavath is running a Chess Club in the Library and they meet every Monday at Lunchtime. But they can play chess any lunchtime in the Library. Pop up to watch or join in! Looking forward to seeing you all in the Library this year! We had another wonderful Living Books Event in the Library today (3rd August 2017). 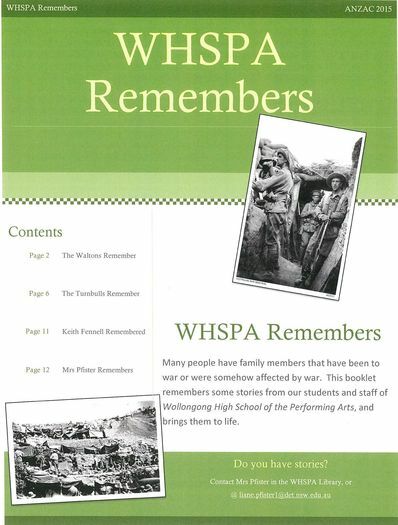 A group of amazing volunteers came along to WHSPA to tell us their inspirational stories to Year 9 students. Each student got to listen to two 'Books'. Many students found the experience humbling and appreciating their own lives, but also inspired by the courage and strength of the 'Books'. Timmy Came to school today! Timmy is Mrs Pfister's Cat, who went missing for 62 days and is now home safe and sound and happy! A Personal Interest Project (PIP) is a project on a topic that interested the student. The students needed to think carefully to identify a topic or area of interest that allowed them to conduct research and create something that reflected their interest and allowed them to explore and investigate that topic. As part of their process the students also had to write a Visual Diary detailing their journey. 7E2 have been working on their PIPs the end of Term1. On Friday 12th August 2016, the students presented their projects to their parents and peers. And they were all amazing! I was very proud of all of them and the hard work they had put into their project. Go to the Photo Gallery and have a look at the photos. In this program the ‘books' are made up of local residents from many walks of life, who are there to share their life experiences and life choices. 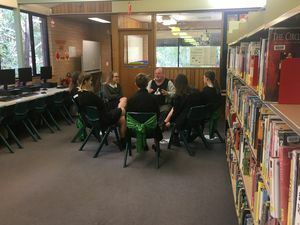 ‘Readers' (year 9s) were invited to engage in two half hour conversations with a ‘book' in our library. The living ‘books' are an extraordinary group of volunteers who enjoy sharing their stories with others. Their backgrounds are diverse, in terms of culture, language and faith background, gender, sexuality, age, ability and occupation. Their stories are about survival and inspiration. The catalogue of living ‘books' aims to include stories that are not given a high profile in mainstream media. The program is run by Wollongong City Council. If anyone needs any support services, please see the attached flyer, or speak with one of our Counsellors or Student Support Officer (Michelle Montgomery). My latest display made from books! With pictures of my lovely Roll Call Class 7.3 in the baubles! We were lucky enough to have Brothers3 here on Thursday 5th November 2015! They were kind enough to come and have a chat with our students about their experiences and give some advice on creating music and music as a career. There were six very excited music classes that enjoyed their time with these guys, especially the photo session at the end! Straight off the bat, they weren't your average X Factor contestants. 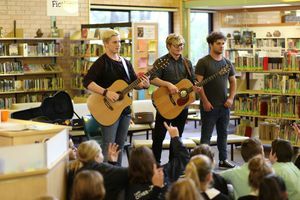 Three farm boys from Mudgee, NSW, raised without electricity, running water or sewerage, just so that their mother could afford to buy them instruments and drive them across country to their shows. Makirum, Tayzin and Shardyn Fahey-Leigh have clocked up six Tamworth Country Music Festivals already. At their first, aged just 10, 11, and 12 years old respectively, Mak was so small that he could barely hold a guitar, but that didn't stop the crowd going wild. "There was one guy who was so drunk that he thought that if he lit himself on fire he could put it out with a whip," recalls Mak. "They had to throw buckets of water on him as we were playing." And if you can keep singing through that, you can handle a live TV performance to an X Factor audience of over 1.4 million. I've been published - whoohoo! Wollongong City Council run a fabulous event called 'Living Books', that we hold every year in our library. I've written about it in the latest SCAN magazine. SCAN is an online journal for educators. - "Be who I am, no matter what"
- "Don't take life for granted"
- "You get to know how it feels to be in their shoes"
- "I liked that they could tell their true stories without being afraid of being judged"
- "Just live life one day at a time"
- "Not to put myself down, stay positive"
- "Be yourself, everyone else is taken"
- "I am more open-minded to different sexualities"
- "To be yourself – we are all individuals and have the power to survive any of our problems." - "I shouldn't complain about little things." - "If you want a good life you have the opportunity to make it happen." I'm back! I've been away for a while, but I'm here and ready to help! 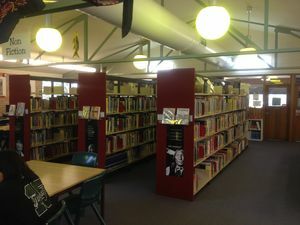 Year 9 will have the unique opportunity to experience Living Libraries. The Wollongong Living Books program brings to the community a collection of human ‘books' that represent a diverse range of backgrounds and life experiences. Instead of reading a book, you talk to a person in the setting of a library or school. 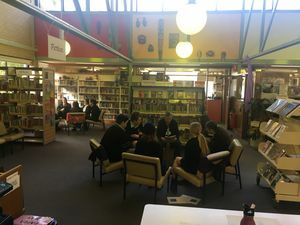 Readers (year 9 ) are offered the chance to engage in an informal half hour conversation in small groups with the living ‘books' about their lives and life choices . During this week we will be celebrating reading and the Australian Children's Book Awards. Come up to the Library and see our activities. As part of the Year 7 Library course, the students study Picture Books as part of their learning about Visual Literacy. As part of this course the year 7s make their own picture books on PowerPoint. During the BookWeek celebrations I will be taking 7A to read their picture books to the excited students of Keiraville Public School. Paul is the owner of the children's Bookstore at Beecroft. He has a Master of Education, working almost 20 years as a teacher of Upper Primary and Secondary. He has won numerous awards in teaching such as a Quality Teacher Award , The Premier's English Scholarship and awards for his co-ordination of Regional Shakespearean Festivals. His interests include the development of literacy with a particular interest in reading for gifted children, Boys' Literacy and books for adolescents. Paul won the inaugural Maurice Saxby Award in 2012 for his contributions to raising the profile of teen fiction. He is an amazing and interesting speaker. We had a wonderful visit to our Library from entertaining author Richard Harland. He spent all day telling year 7 about his journey as an author, and about his novels. Everyone loved listening to him and they all lined up to get an autographed copy of his new book, Song of the Slums. You may remember him from the book WorldShaker. Yesterday, Ms Martin, Class 7A, and I went to visit Keiraville Public School. 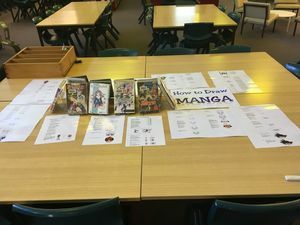 As part of my Library Program with Year 7, and in collaboration with the English Faculty, I teach Picture Books as part of their Visual Literacy section of the Syllabus. To finish up the program, the students make their own Picture books, usually in PowerPoint, and share them with their class. Every year, to celebrate Book Week, I take one lucky class to a local primary school to read their picture books to the younger students. This year 7A was lucky enough to go. 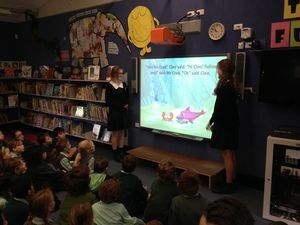 7A presented some great picture books to six primary classes from Kindy to Year 2, who enjoyed every minute of it! For more photos and to have a read of the picture books, check out my other folders. 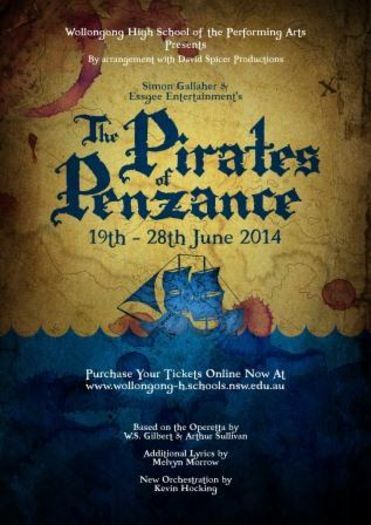 Going to see Pirates of Penzance? Before you go, after you pick up the kids new uniforms from Poppets, and purchase some lovely new clothes for them from dream Designer Childrenswear at Fairy Meadow, head down to Bendigo Bank to open up an account to save for your holiday; Then drop your kids at Theatremax for a drama lesson, afterwhich they'll be dying to play an instrument at Wollongong Conservatorium of Music; Wave 'Hi' to Sharon Bird jogging past on her way to buy the fast selling tickets to our show! While you're waiting for the kids, pop onto the Engadine Music Centre website and buy that trombone you've been dreaming about, then phone up Mortgage Choice limited to discuss re-mortgaging your house to pay for all of this! Then head to Coconut Thai for some dinner because you're too exhausted to cook! Buy you're tickets now - they're selling fast! 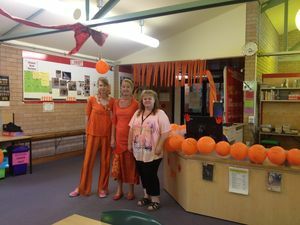 We won the best decorated Faculty for Harmony Day - YAY! Me and Michelle dressed up for Harmony Day! Are you sick of living in reality? Then perhaps you would prefer living in one of 8EN's Fantasy Worlds. If you could create your own world - What would it be? And there was an amazing array of worlds presented. Come and see them all displayed in the Library now! Assemblage is a form of sculpture comprised of "found" objects that are arranged in such a way in order to create a piece of art. This display is from Year 10 Visual Arts.